Good City Brewing hosts its second Density Day this Saturday. Expect fans of the barrel-aged stout to line up to get their hands on a few bottles. When you have 100,000 beer drinkers pass through your brewery doors in less than two years, you’re certainly doing something right. That’s been the case at Good City Brewing (2108 N. Farwell Ave.), a spot that has quickly become a staple for local craft beer lovers since opening in the summer of 2016. There are plenty of reasons for the crowds. The delicious curry fries on an excellent food menu don’t hurt, but the draws are well-crafted brews like Motto Mosaic Pale Ale and the deliciously dank Reward Double IPA. This weekend, Good City releases another standout, the extremely limited Density Barrel-Aged Imperial Stout. The 2016 version was excellent, and this year’s batch is no different. It has a slightly bitter dark chocolate flavor and, despite a potent 11.2% ABV, isn’t overly boozy. Roasted malt comes through and Density avoids the cloying sweetness of some barrel-aged stouts. “I think we were going for a true-to-style Russian imperial stout that would up to the barrel well,” explained head brewer Andy Jones. Mission accomplished. Barrel-Aged Density is a beer that people are likely going to line up for this Saturday morning on “Density Day,” well before the doors open at 10 a.m. (9:30 a.m. for Good Citizen Loyalty Members). There are only roughly 1,200 bottles available, so getting there early is a good idea. It will also be available on tap, and the 2016 version will go on tap at 11 a.m. The busy brewing area at Good City. When Good City opened in June 2016 in the space that once held Crank Daddy’s Bicycle Works, there was room to grow. Good thing. Growth has been a constant at the brewery. Good City opened with four 17-barrel fermenters and added five more over the next eight months to reach a capacity of 2,500 barrels. An expansion in August added four 34-barrel fermenters, and next spring the brewery plans to add two more. The total capacity after everything is up and running will be an impressive 6,000 barrels. 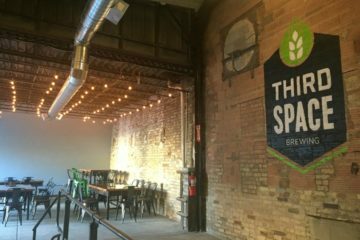 Good City has also added a canning line, a popular rooftop deck and a large event space.